"Lucille's Mountain Top Inn & Spa is a proud recipient of a TripAdvisor 2012 Certificate of Excellence for exceptional traveler ratings." 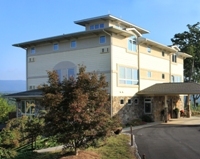 On a mountain top with spectacular 360 -degree views, Lucille's 10 room inn and day spa provides a perfect retreat for exploring Georgia's wine country. Enjoy a gourmet breakfast, indulge yourself with a Swedish massage or rejuvenating facial, or just relax in front of a fireplace in one of our luxury rooms. Lucille's is where relaxation meets the mountains.